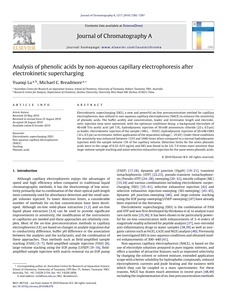 Electrokinetic supercharging (EKS), a new and powerful on-line preconcentration method for capillary electrophoresis, was utilized in non-aqueous capillary electrophoresis (NACE) to enhance the sensitivity of phenolic acids. The buffer acidity and concentration, leader and terminator length and electrokinetic injection time were optimised, with the optimum conditions being: a background electrolyte of 40 mM Tris朼cetic acid (pH 7.9), hydrodynamic injection of 50 mM ammonium chloride (22 s, 0.5 psi) as leader, electrokinetic injection of the sample (180 s, −10 kV), hydrodynamic injection of 20 mM CHES (32 s, 0.5 psi) as terminator, before application of the separation voltage (−25 kV). Under these conditions the sensitivity was enhanced between 1333 and 3440 times when compared to a normal hydrodynamic injection with the sample volume <3% of the capillary volume. Detection limits for the seven phenolic acids were in the range of 0.22�51 ng/mL and EKS was found to be 3.6�9 times more sensitive than large-volume sample stacking and anion selective exhaustive injection for the same seven phenolic acids.